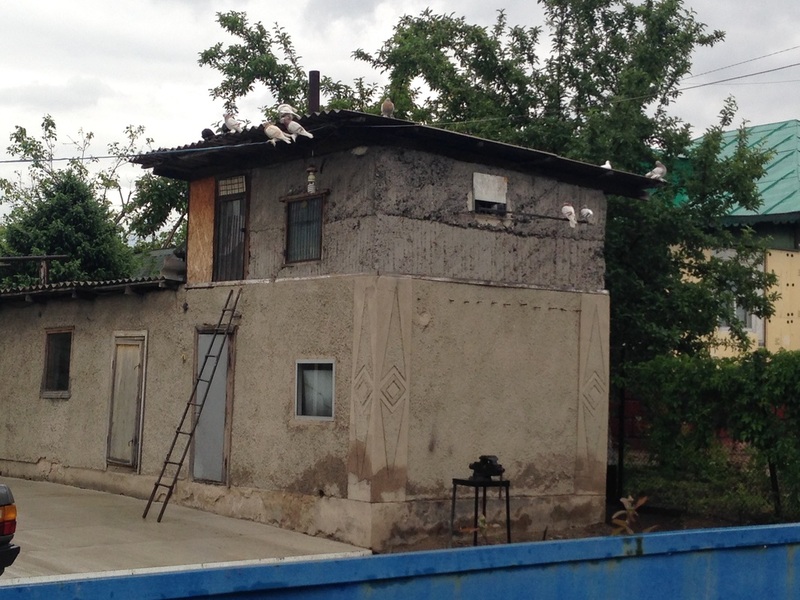 I was walking once through a neighborhood of Almaty called Aisha Bibi when a bunch of funny-looking pigeons blocked my path. 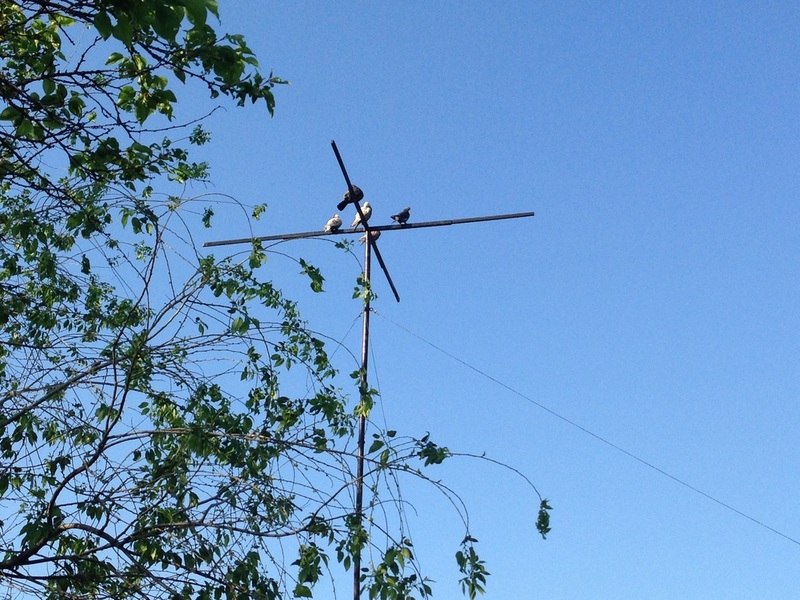 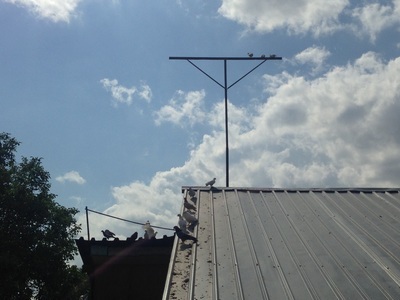 When I asked them nicely to move, they flew up to the ridge of a roof nearby, and I noticed that they had a strange mutation, big fans of feathers radiating out from their feet. 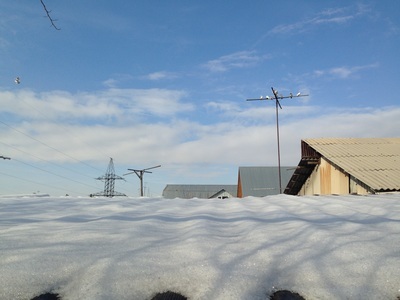 Something ain't right, I thought, so I got brave and knocked on the gate. 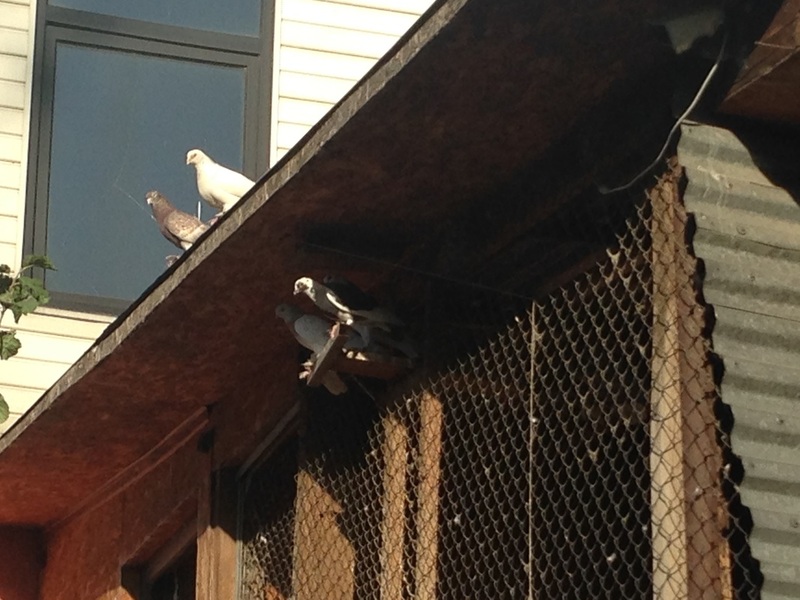 "Are those your pigeons?" I asked. The boy who answered the gate told me yeah, they're my dad's pigeons, and invited me into the family yard. 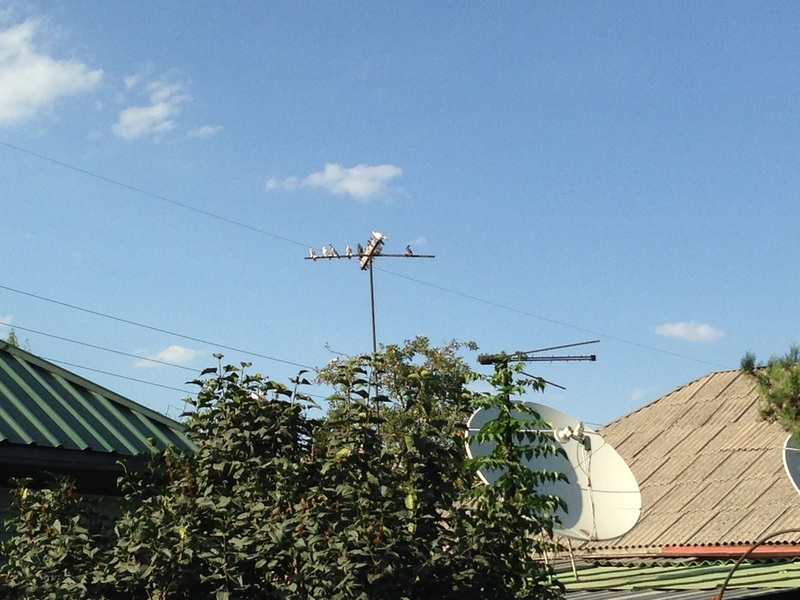 His dad, Zhakyp, found my curiosity curious - it's not every day that Americans come knocking with insistent questions about pigeons. Still, he proudly showed off his coops and threw some birdseed on the ground so that his birds would come closer. 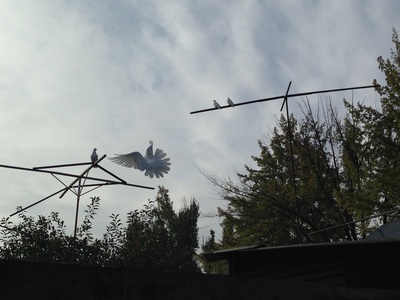 Later, I would learn from a friend of mine, Warren Spencer, that the foot-feathers are called "muffs" by pigeon people, and they're characteristic of many breeds of domestic pigeons, including one that's called, quite wonderfully, the Uzbek Tumbler (and even more wonderfully, they're called tumblers because they're bred to do backflips in the air). It turns out that pigeon-breeding is a hobby that's been in Central Asia for centuries, and Zhakyp told me that every Sunday you could find pigeon breeders at Верненский рынок [Vernenskiy rynok; a rynok is a market and Vernenskiy is the adjective form of Verny, Almaty's former name]. Of course I had to go. 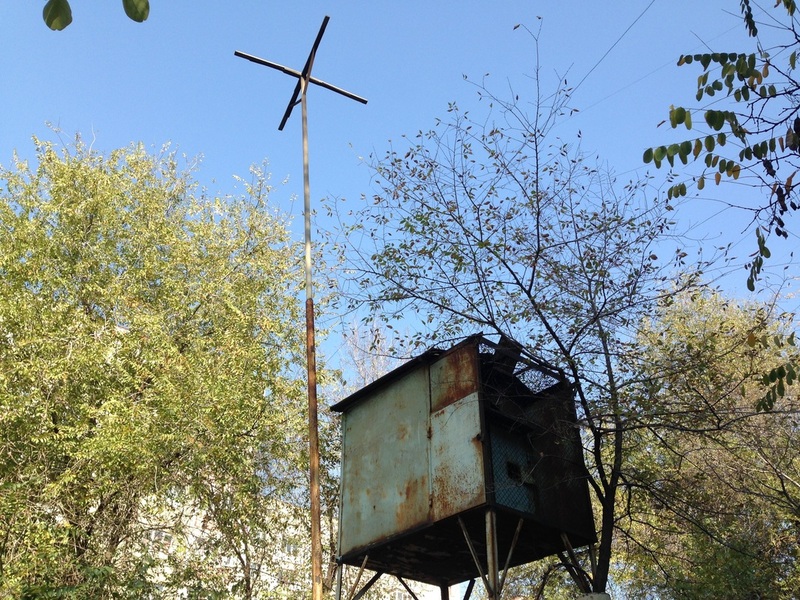 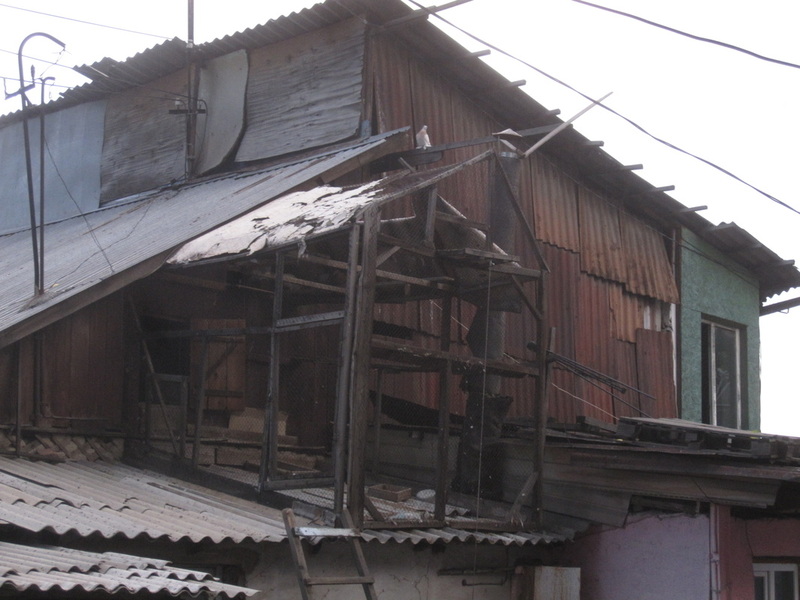 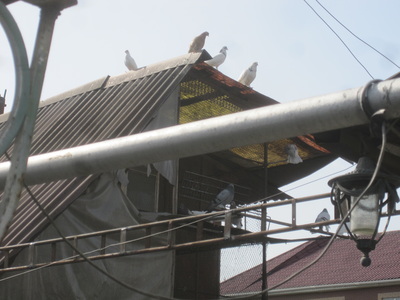 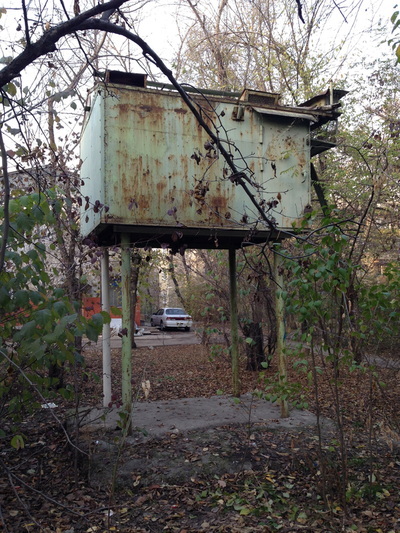 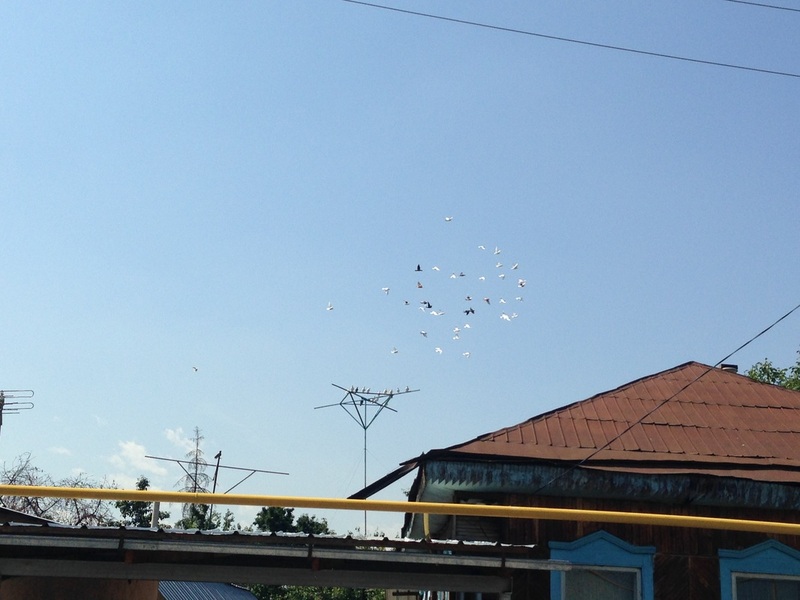 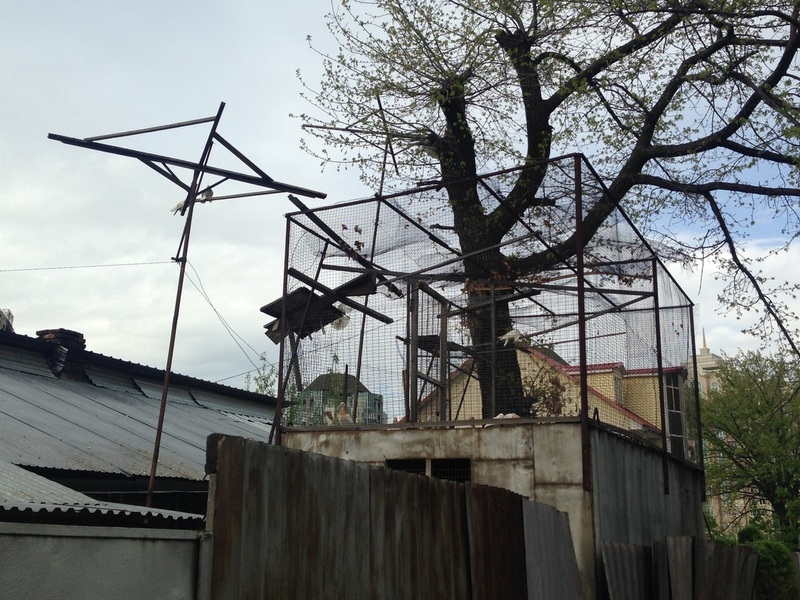 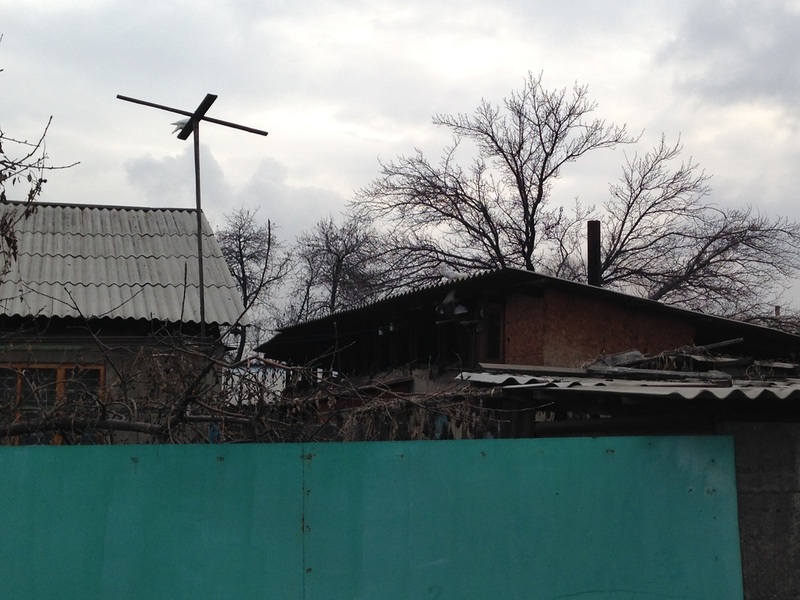 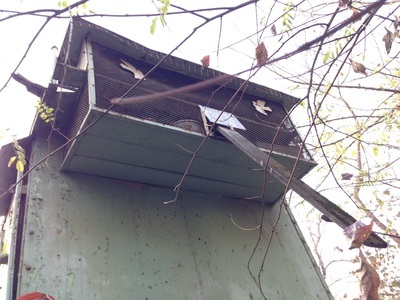 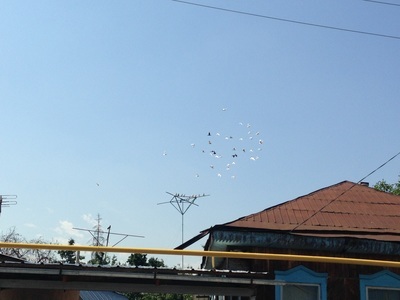 Since that first foray into Almaty's pigeon universe, I've seen these muffed birds in various neighborhoods throughout town, always in the chastny sektor [частный сектор; lit. "private sector", the dusty, unplanned neighborhoods that are found outside of the city center.] 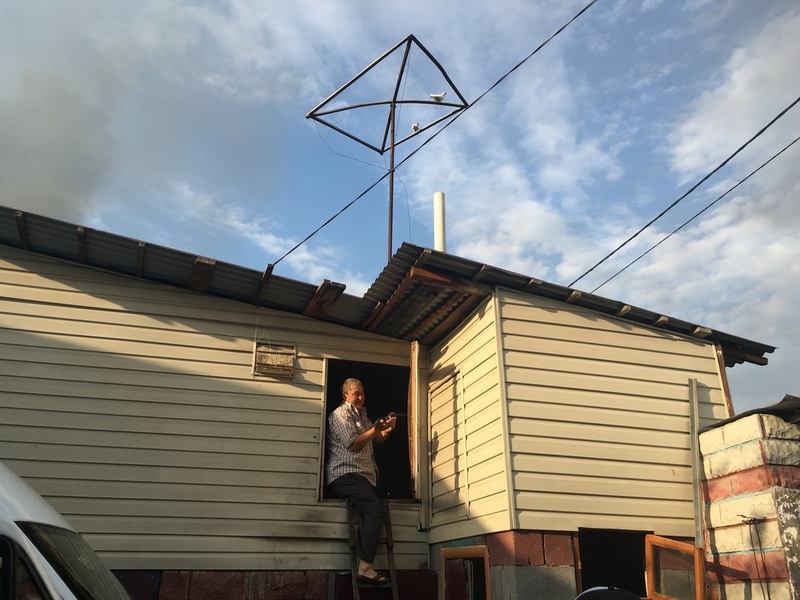 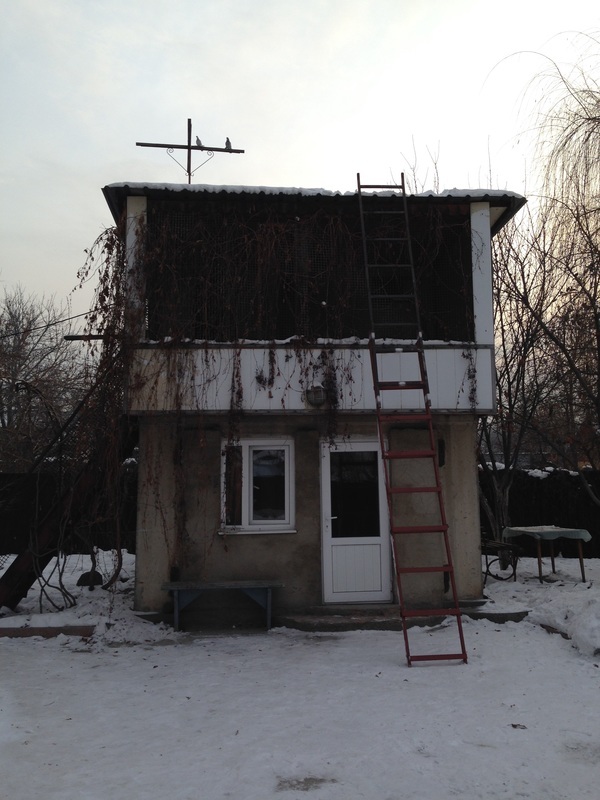 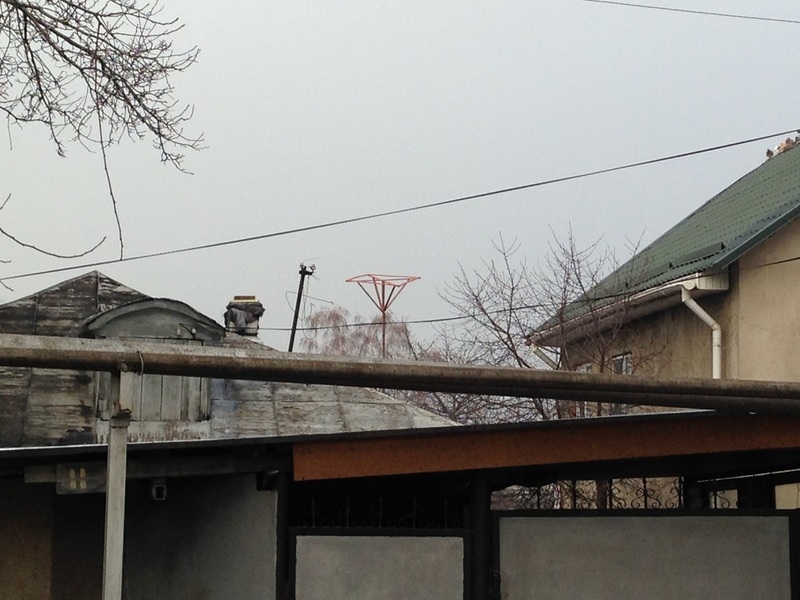 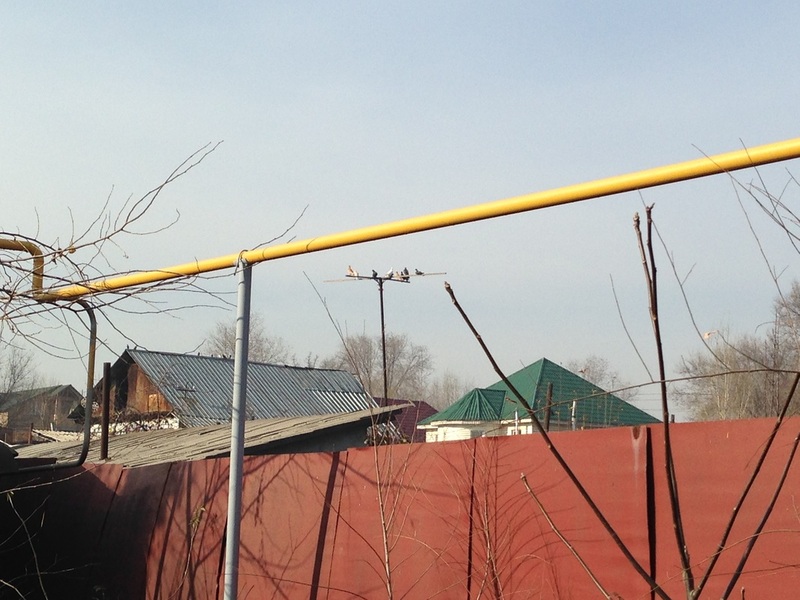 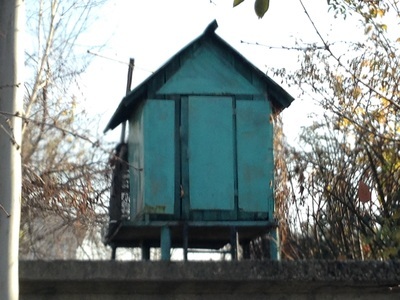 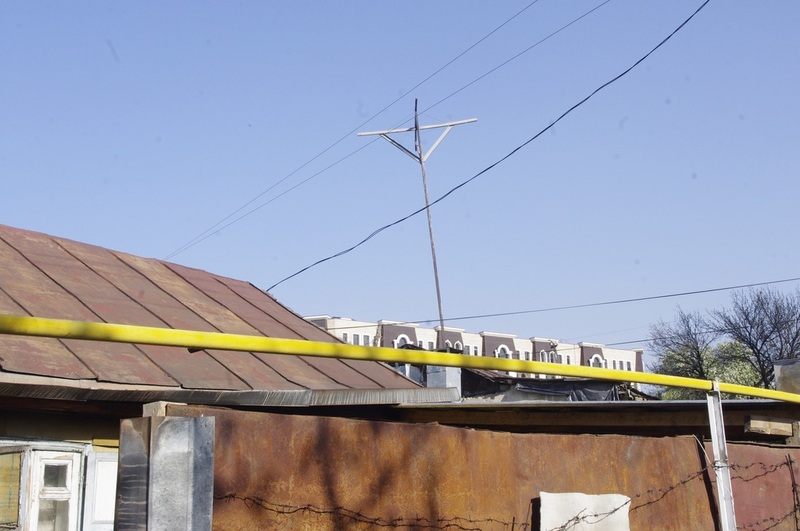 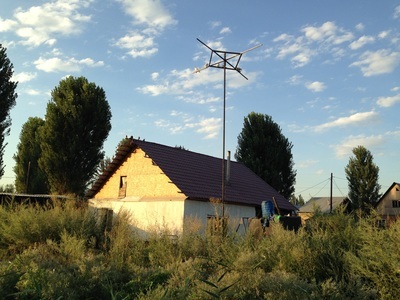 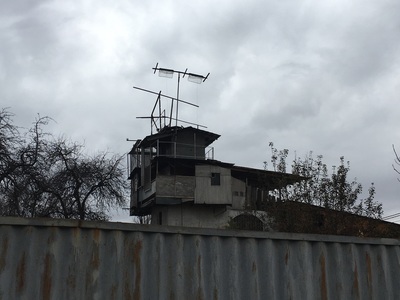 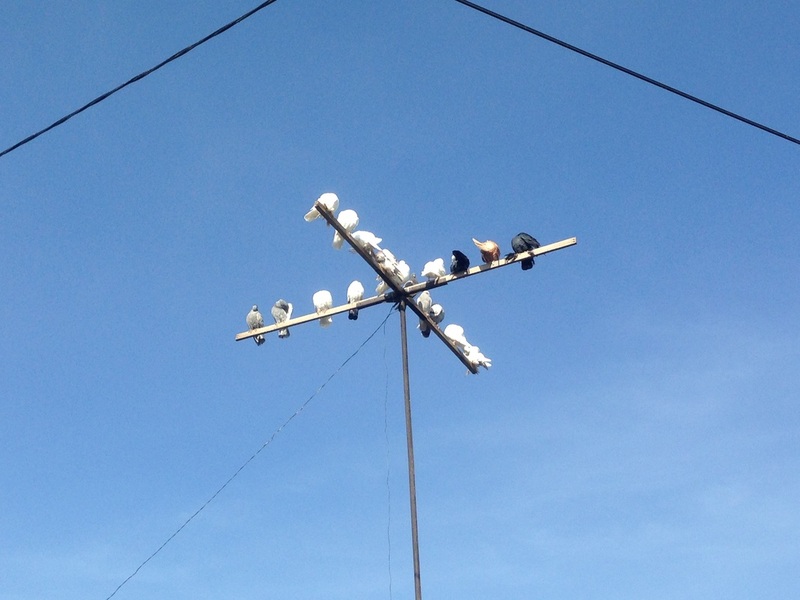 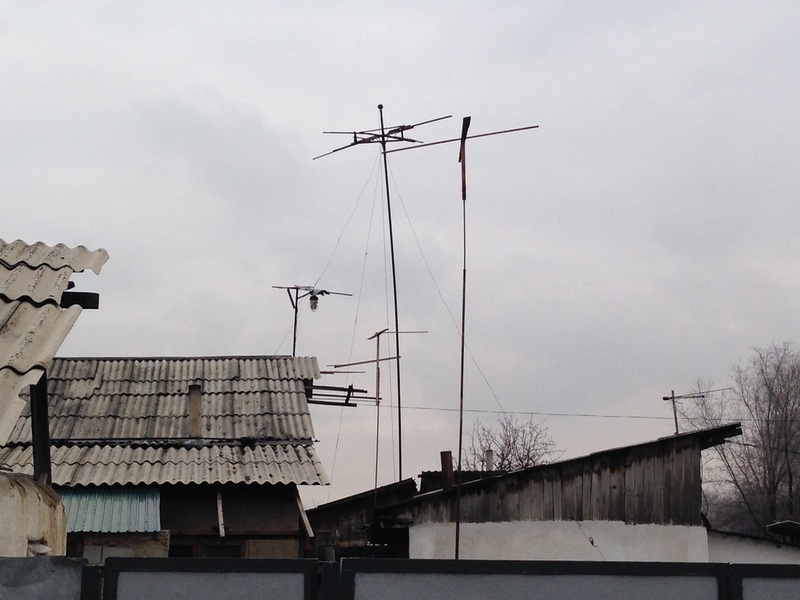 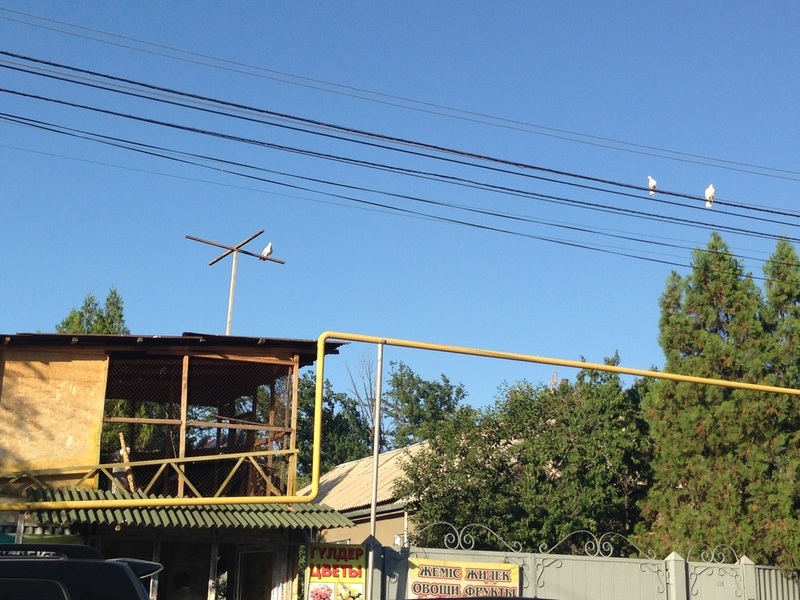 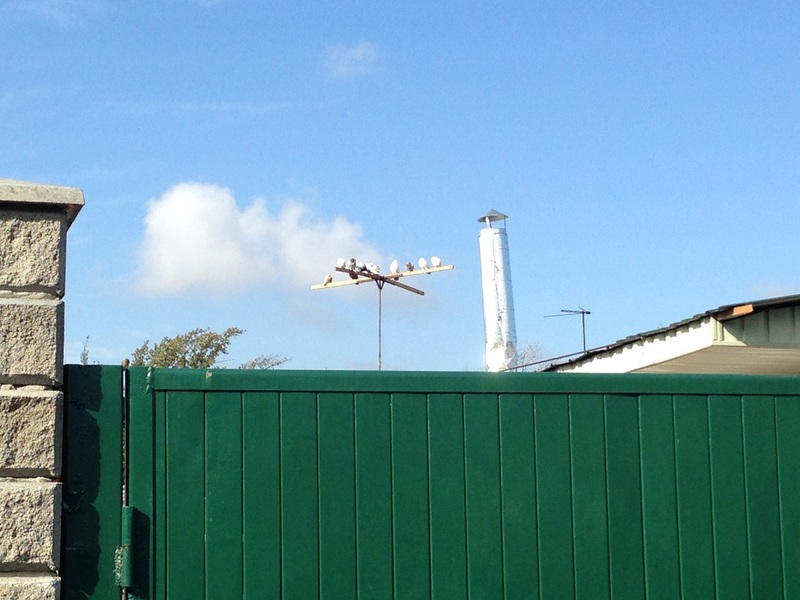 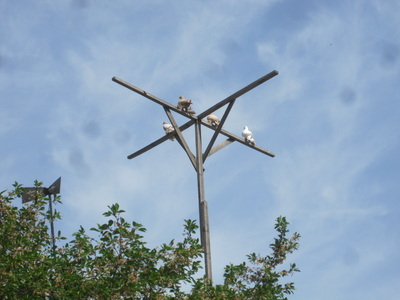 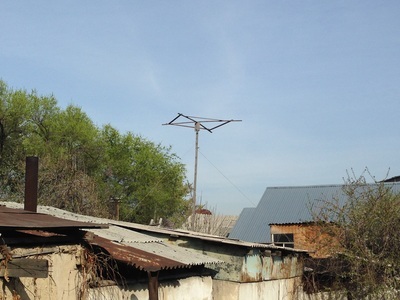 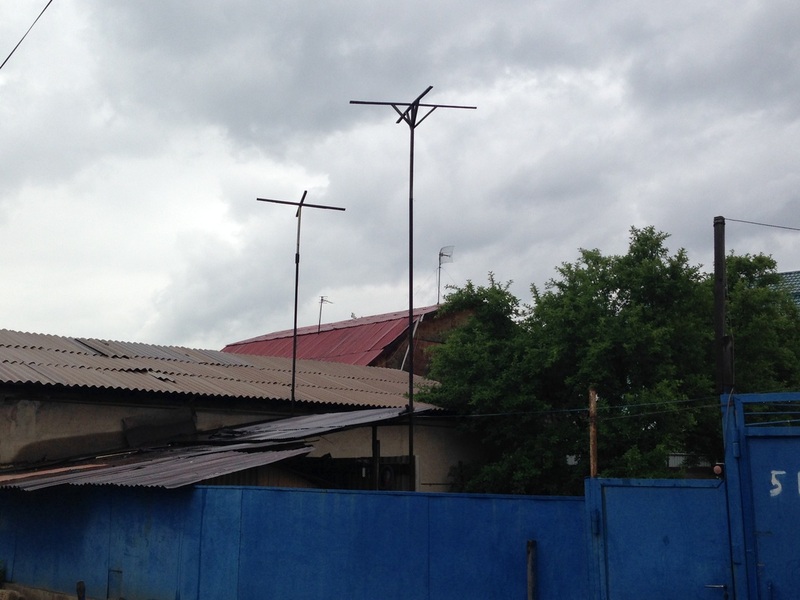 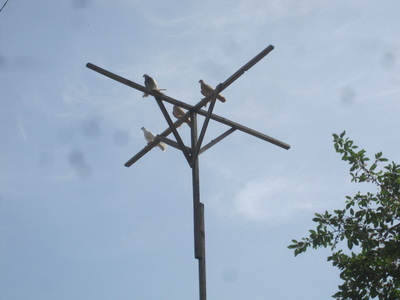 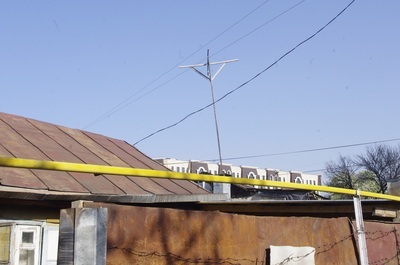 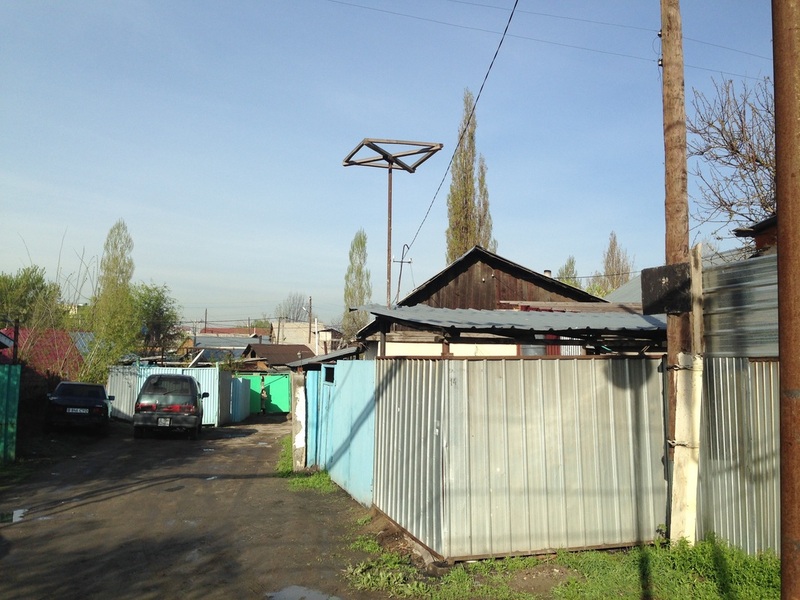 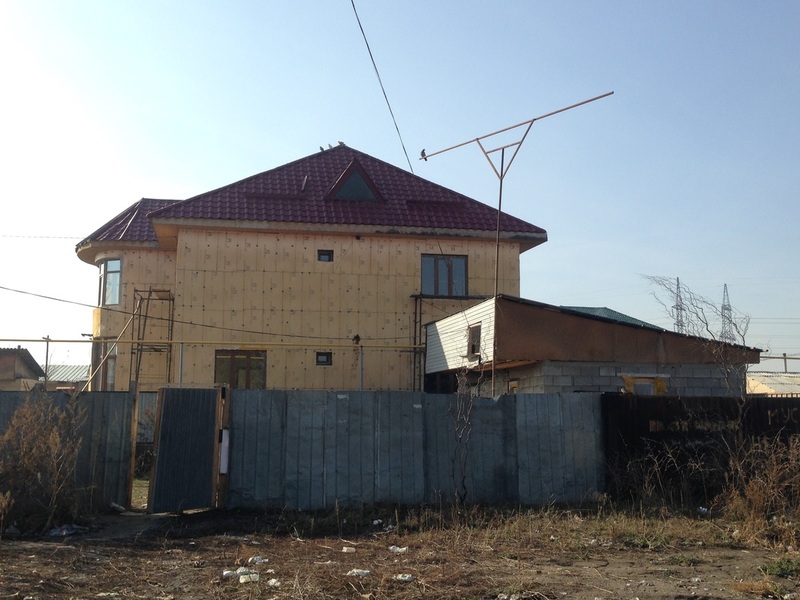 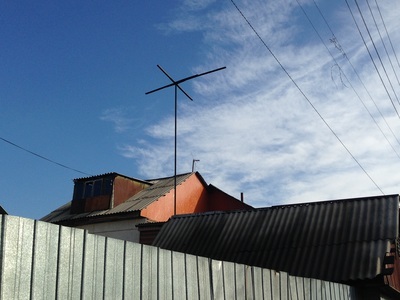 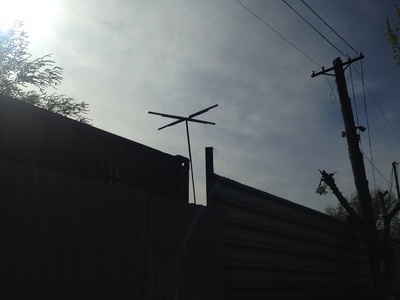 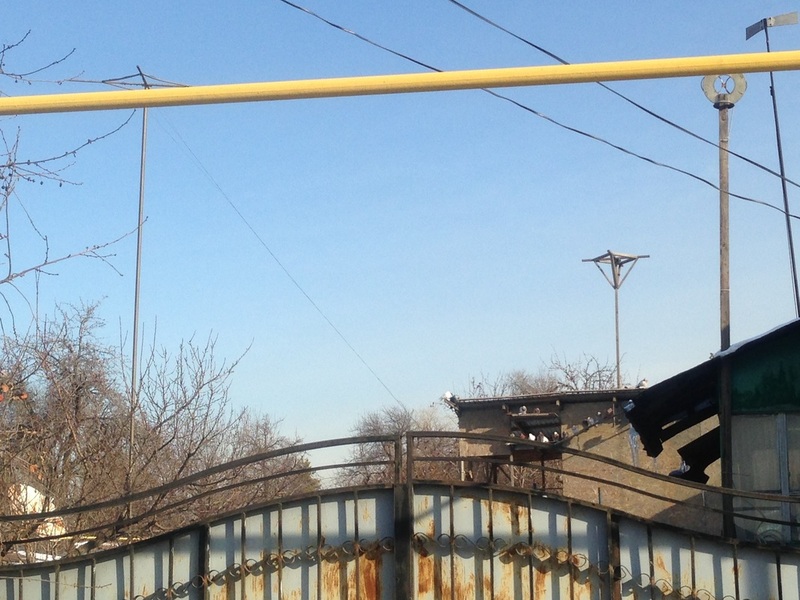 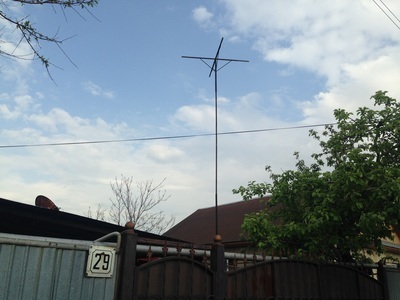 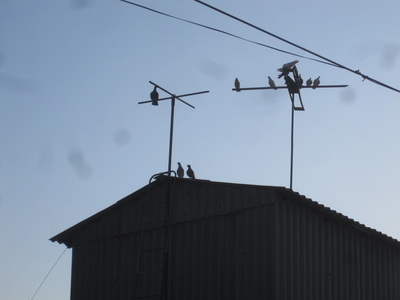 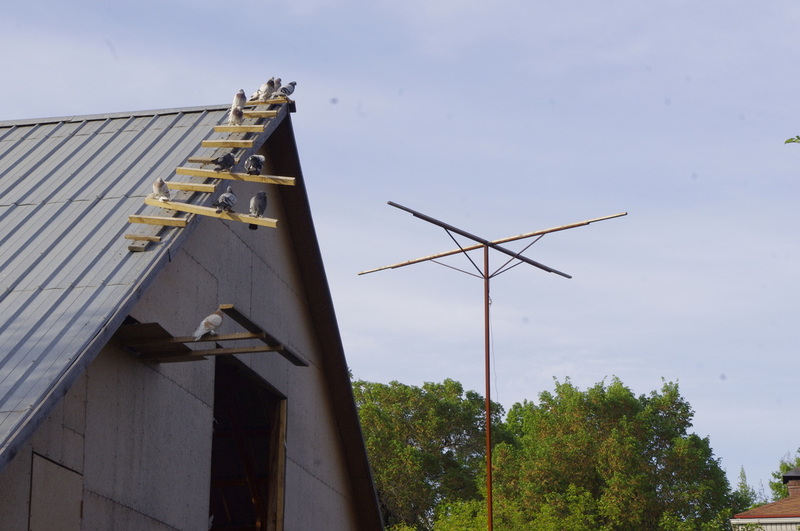 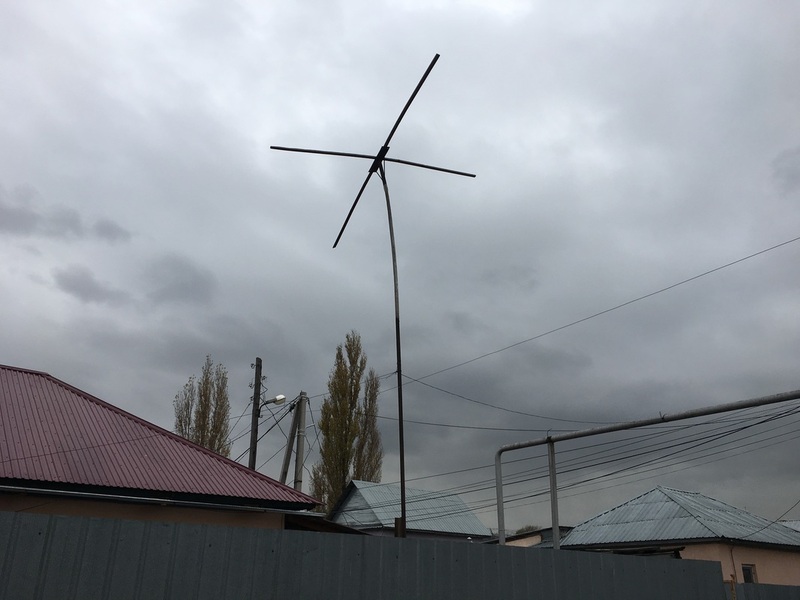 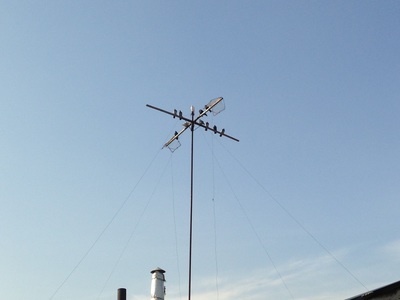 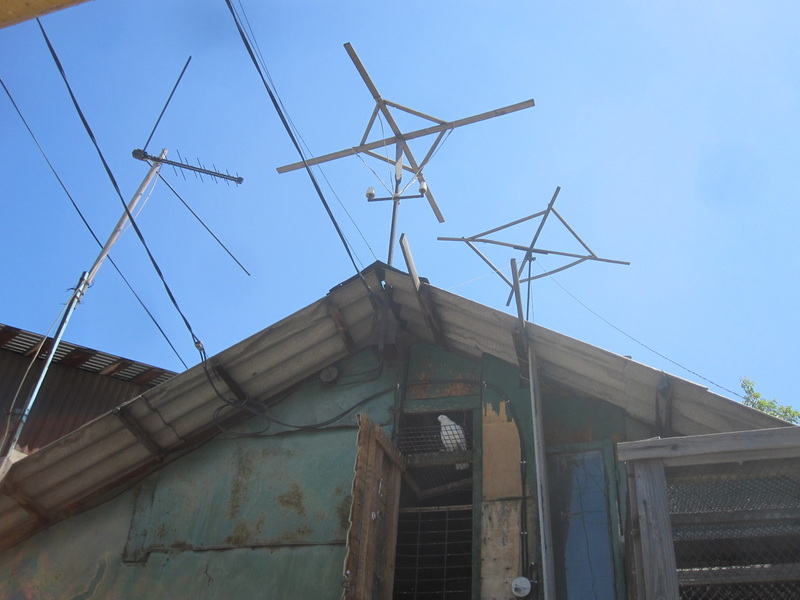 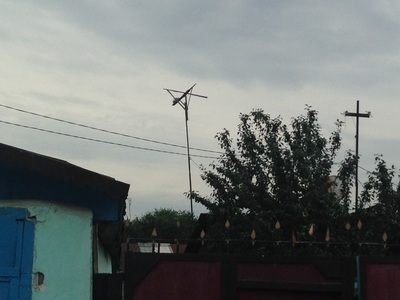 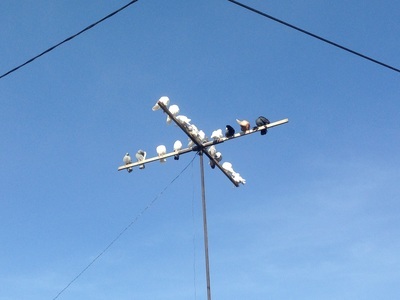 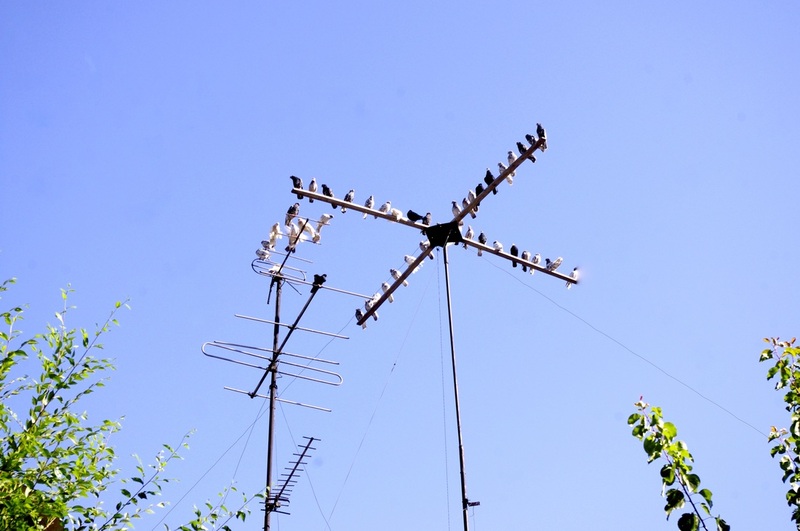 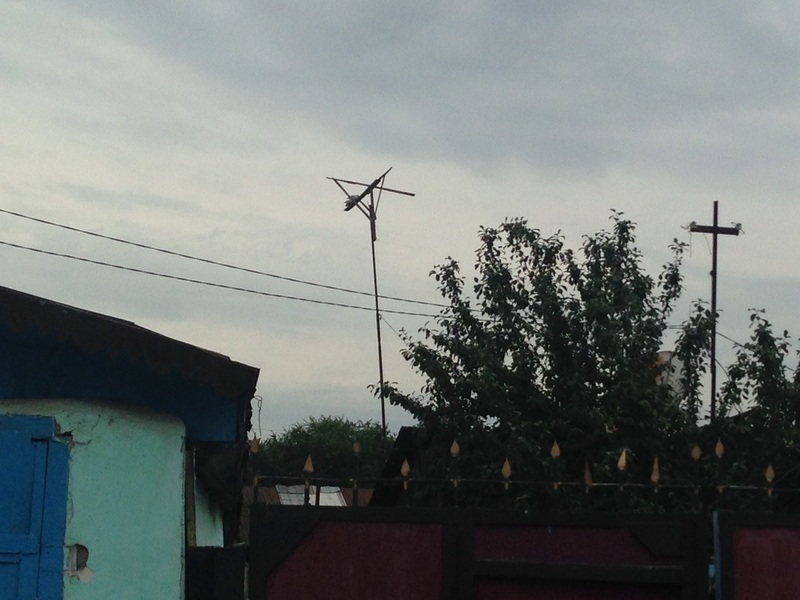 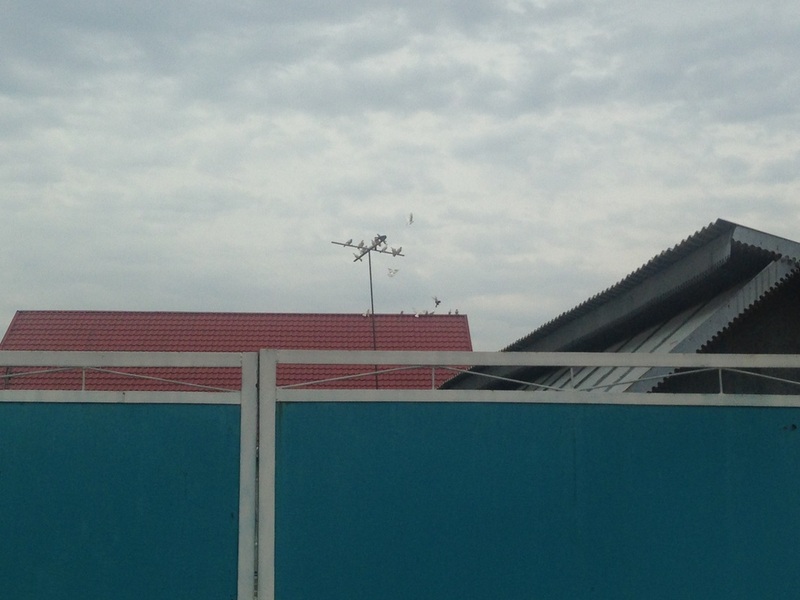 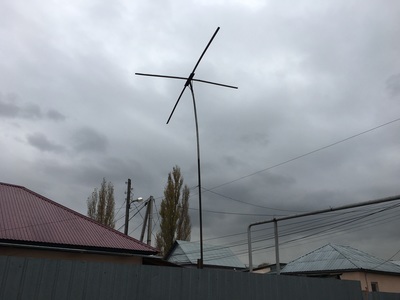 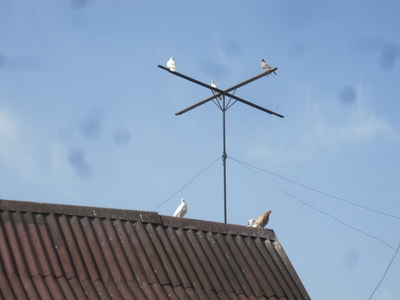 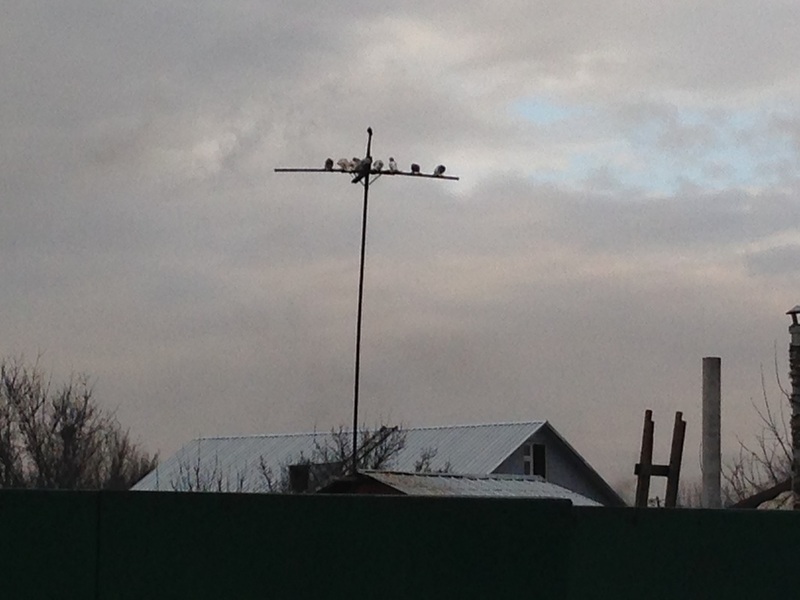 Especially in Uzbek and Uyghur neighborhoods, you might see these tall poles rising above the courtyards - they are pigeon perches, and that's when you know you've found a pigeon fancier. 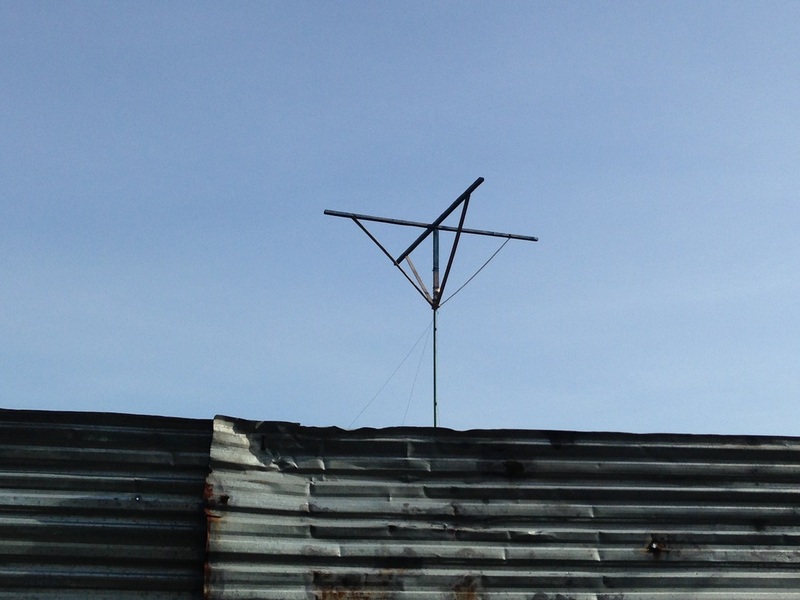 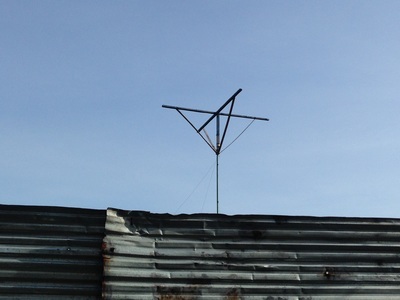 Sometimes they've got a cross shape at the top for the birds to sit on; sometimes it's a square. 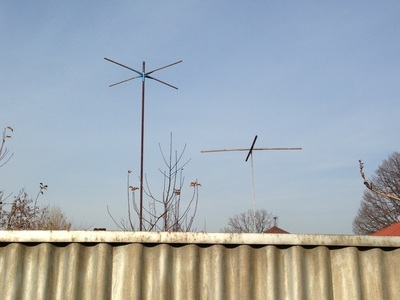 They're all made with cheap metal. If you see one, and you're feeling brave, go knock on the door!